The faster the 2011 Entry Draft gets here, the harder it will be to ignore the soaring stock of forward Seth Ambroz. The 6-foot-3, 202-pound "freak" -- the words of Omaha Lancers coach Bliss Littler -- has grown right before our eyes, and it seems no one is going to stand in his way of fulfilling Ambroz's lifelong dream of being drafted by an NHL team. In the meantime, Ambroz will look to improve on an already impressive resume that included a pretty eventful 2009-10 season. He led the U.S. Under-17 team to a 3-0-0 record with 5 goals at the 2009 Four Nations Cup and earned a silver medal for Team USA at the Ivan Hlinka Memorial during the summer. "There were great players out there and it was fun going overseas, but we just couldn't pull it out in the end -- we'll see a lot of those players again some time," Ambroz told NHL.com. 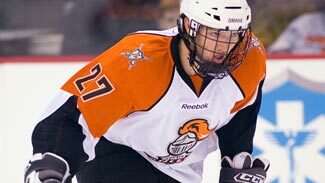 When Ambroz joined the USHL's Omaha Lancers as a 15-year-old rookie in 2008-09, he immediately turned heads, scoring 14 goals, 17 assists and 88 penalty minutes in 60 games. It certainly helped to have talented linemates like Louis Leblanc, Montreal's first-round pick (No. 18) in 2009. "Playing with Louie (Leblanc) and Pat (Mullane) helped me a lot," Ambroz said. "Louie just had that attitude of wanting to play hard and he would never quit. Being with him every day was a great thing for me to have." Ambroz has been lauded for his tremendous shot and willingness to stick up for teammates. He's been involved in six fights over two seasons in the USHL. "I know I have to bring a big physical presence ... play big around the net, work the corners and be able to muck it up a little bit," Ambroz said. "I'm comfortable with (dropping the gloves). I'm not going out there looking to fight all the time, but I know that's the game and sometimes you can't avoid it." That's quite a statement from a youngster who chose the collegiate route over major junior. Ambroz was drafted by the Seattle Thunderbirds of the Western Hockey League, but committed to the University of Minnesota after scoring 35 goals and 68 points in 22 games in his final season at New Prague High School in Minnesota. While the Canadian Hockey League remains an option, it's looking more and more like Ambroz will join the Gophers in the fall of 2011. "I grew up watching the Gophers, but you can't go wrong either way, both leagues (USHL-NCAA, major junior) have good programs," he said. "I just need to keep working hard and progressing wherever I am." Ambroz will spend a third season in Omaha before joining Minnesota. The Gophers' coaching staff actually informed Ambroz that there wasn't a spot open this fall since the team has a seasoned group of returning upperclassmen. "There were no guarantees (in Minnesota) and I knew I'd get more exposure in Omaha where I could show off my skill and get a lot more playing time," Ambroz said. "It would have been great playing for the U, but I need to stay mentally tough and focus on having a great year." If his 2009-10 season is any indication, that shouldn't be a problem. Ambroz scored 22 goals, 49 points and 118 penalty minutes in 56 games with Omaha last season and he'll look to build on those statistics despite being one of the youngest players in the league. Central Scouting's Jack Barzee, who specializes in U.S. prospects, expects Ambroz to impress in his draft season. "He'll give his opponents fits when they try to cover him in front of the net," Barzee told NHL.com. "He's a power forward who likes to drive to the net at every opportunity. He has very good hands with a quick release and will catch goaltenders by surprise. He scores goals in many ways and makes big plays. "He loves to battle along the boards and, in the corners, protects the puck with confidence. He's aggressive and tough and will fight; he's a team leader. I'd be very surprised if he isn't drafted in the first round." There's little doubt Ambroz will be among the top 15 players chosen in June. He admits having an opportunity to be drafted at the Xcel Energy Center, the same arena that was literally his home away from home growing up, would be something special. "I'll have a lot of support there so it should be great," he said. "But I'm not thinking about it too much right now. I'm just trying to continue my development ... I'll be thinking more near the end of the season." The hockey lineage in the Ambroz family runs deep. His sister Kacey is a junior at the University of Minnesota-Duluth, and his brother Matt (6-foot-4, 207 pounds) is a senior at the University of Nebraska-Omaha. Matt notched career highs in goals (10) and assists (14) as a junior and led the team with 65 penalty minutes. Seth credits his brother for "opening some doors" for him. Still, he realizes there's more work to be done in order to become the player he'd like to be. "I could still work on getting faster and quicker, but there's room to improve in all areas really," he said. "Getting stronger is important too." "Seth needs to get a little quicker off the mark, as he's not a pretty skater for me ... yet," he said.